Blue Wealth's research methodology has been developed by a team of industry professionals and combines years of experience, study and analysis. It is the country's most comprehensive, up-to-date research methodology. This step uses macro economic analysis to identify geographical regions that are likely to experience strong capital growth. Our research indicates that the following factors impact the property market. 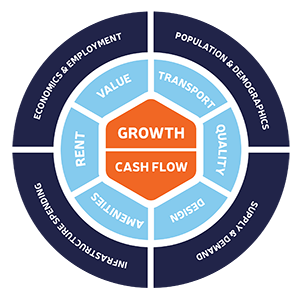 Growth is the key for creating long term wealth, however we recognise that many clients are sensitive to cash flow and as a result Blue Wealth only approves properties that have scored at seven or above for both these categories. The Blue Wealth Index provides investors with a simple way to compare investments and ensure they acquire properties most suitable for their portfolio. Who looks after a rental property on behalf of the owner? 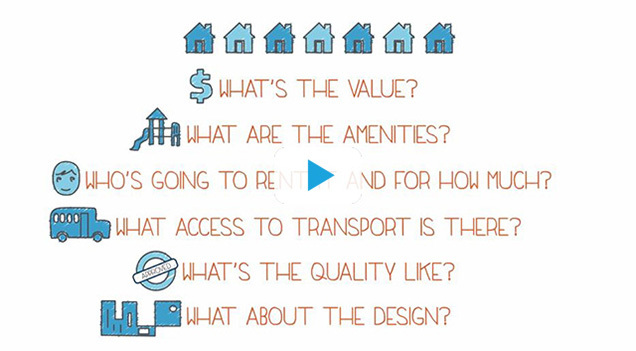 What is the technical term for the rental return of an investment? The period where a property market remains stagnent is called? If your $450,000 property is yielding at 4.8 per cent, what is the weekly rent? If the yield on a $500,000 property declines from 5% to 4.8%, the weekly rent is reduced by how much? Thank you for completing the property quiz. Your score is out of 5.